On 25th February, Ms Beatrice Lamwaka, Mr Bob Kisiki and I spoke to students of the Literature Club of Kira Senior Secondary School. In our various capacities as writers, journalists and culture curators, we acknowledged the ways in which literature can shape critical thinking abilities. We also encouraged the students to keep journals, diaries and make notes about their daily lives. In turn, these writings could become material to boost their dreams of writing. Beatrice Lamwaka met with me at Shoprite after running some errands. Our decision to take a Namugongo bound minibus from Nakawa market appeared ill conceived as the last full taxi left and an empty one awauted us. It would take about an hour to reach capacity. So, we disembarked and took one for Bweyogerere instead. By some fortunate coincidence, we met Mr Bob Kisiki in the same taxi. Our last leg of the journey to Kira SSS was on bodas. The gate keeper let us in and summoned our host, Ms Barbara Oketta, who is a writer and teaches Literature in English. She was shocked. 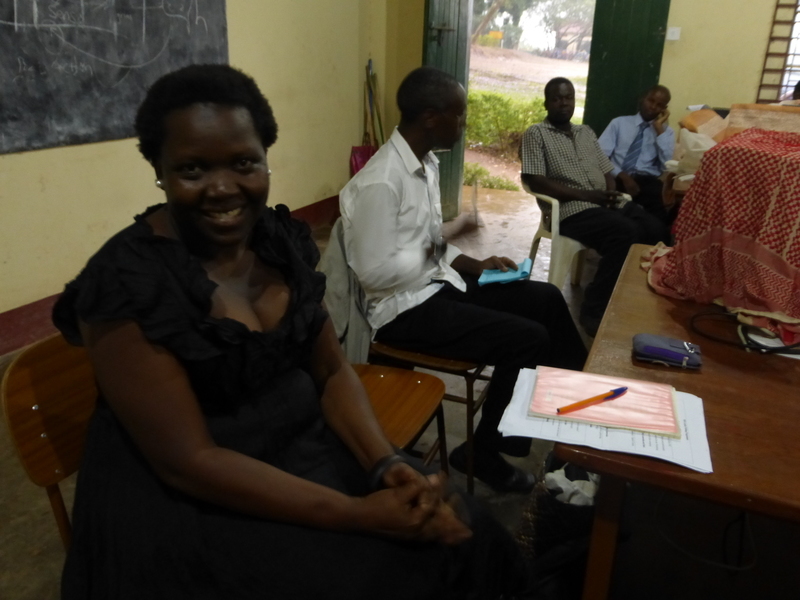 “You’ve kept time,” said Ms Oketta as she led us to the staff room. “But unfortunately the room we wish to use has no electricity yet.” Ms Oketta arranged for us to use their Computer Lab as storm clouds unfurled into dark shapes above us. Many students shrink from offering literature at A-Level, for various puerile reasons. But to be fair, books can be expensive to access, and lack of a solid reading background my hamper the pursuit of literature. We wanted to assure our audience that reading is a valid means to sharpening one’s wits and broadening the mind. Ms Oketta says Kira SSS has been in existence for about twenty three years and this was the first time writers were being invited for a talk. I was very excited about the opportunity because in my secondary school days, there was a tradition for bringing inspirational professionals to give us talks on our potential career choices. We met with staff in the staff room and opened a conversation about the school.The first thing I was curious about was the name Kira, for place names usually bear some significant historical detail. Mr Lawrence Apire Aya, the UNEB Officer in charge of External Examinations –and former Deputy Headmaster, had a conversation about the name Kira with Mr Nason Bwesigye, the Deputy Headmaster. 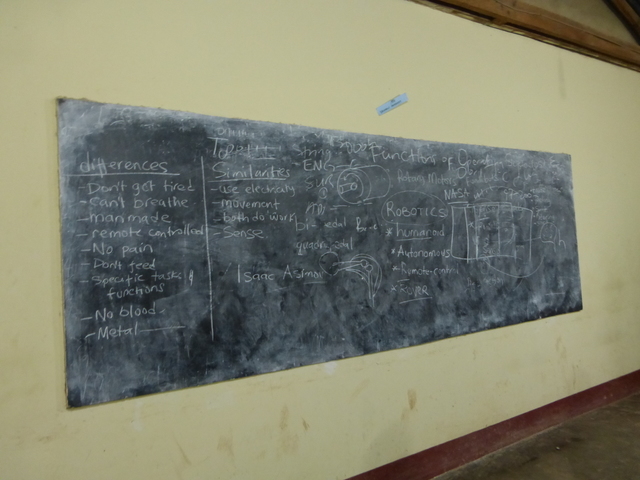 It was fascinating to learn about the commonality between diverse indigenous communities of Uganda. For example some versions of oral history document Kintu coming from the East. We talked about semantic roots of green leafy vegetables in the amaranth family; ubuga in Acholi Luo, bugga in Luganda other Bantu languages and ebuga in Soroti among the Iteso. Mr Apire also opined on the uncanny roots of the word Kabaka. He said kaba in Acholi is the jaw bone, and it might also be the root word for the title Kabaka. Legend says when Kintu defeated Bemba in battle, he slept in his house and when he came out, showed the jawbone of Bemba as a sign of his victory, hence Kaba ka Bemba – where ka is the expression of relationship. “Kira means yam in Luganda,” said Bwesigye. He cautioned that it should not be mistaken with the Lusoga Kiira, with a double ‘i’, which references the waters of the Nile. “Which kind of yam?” I asked, for there are various species of yam such a field yams and swamp yams. “The shapeless one,” said Bwesigye. We all knew that the shapeless one is the field yam. Mr Apire wondered whether the name had any similarities with the word Kir, which in certain Nilotic languages refers to the waters of the Nile – the Shilluk and Acholi call it that. “The Lango, call a pig bunu and the Banyankore call it empunu,” said Apire. “No,” Nason asserted gently. He explained to us that the history of the road is key to understanding the name of the school. “Old Kira Road, behind Kamwokya was the old road that linked the Kabaka’s palace to this area,” he said. This road leads up to the Kabaka’s palace at Bulange. One of the mothers of Kabaka Mutebi used to live in a homestead in the neighbourhood. Today, all that is left of the old homestead is a beautiful stucco house with a big tree standing in the compound. Outside, the rain pelted down, and Ms Oketta came to fetch us one by one under a large green and white umbrella. Literature plays an important role in integrating various branches of learning like science and art. When we were all in the computer room, the blackboard had not been wiped. Descriptive lists stood out to juxtapose human and robot characteristics. It seemed clever and ridiculous at the same time –I was delighted. What stood out for me was the name Isaac Asimov near an anatomical drawing of a joint. Robotics. Isaac Asimov written on middle left of the blackboard. “A human being is a soft, weak creature. It needs constant supplies of air, water, and food; it has to spend a third of its life asleep, and it can’t work if the temperature is too hot or too cold. In the book little Susan Calvin, grows from being a shy girl to an awesome cybernetics engineer. Later, Dr Calvin is speaking to a journalist from the Inter Planetary Press about her dreams, hopes and fears about robots. I imagine the Fundibots team guiding youth of Kira SSS towards self empowerment through robotics –using a book of fiction. Our seminar was a little different from what the Fundibots team had been doing – building robots. This time round, we used the craft of writing as a tool for exploring life. 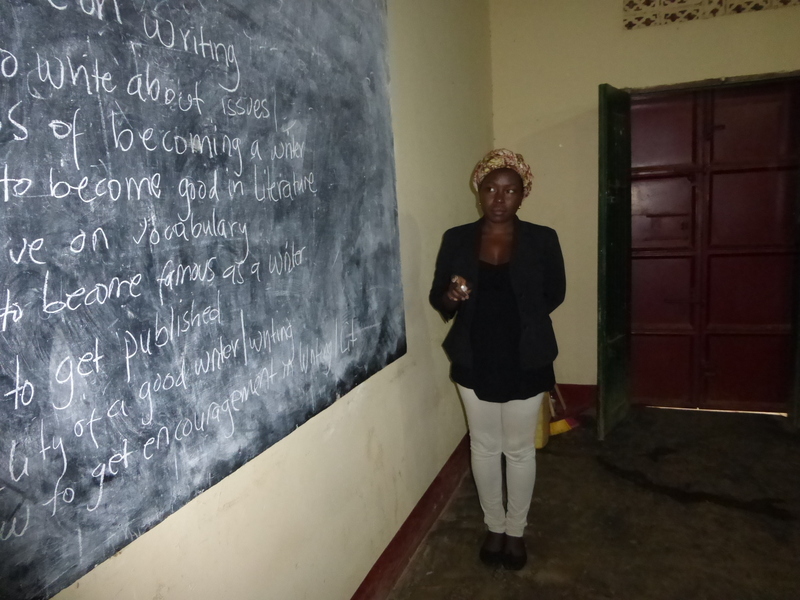 Ms Lamwaka told the students that, “A writer is a person who writes.” She gathered the views of the students, some of who were desirous of: becoming good in literature, improving their vocabulary and knowing how to write, getting published and even achieving fame. Mr Bob Kisiski, Vice President of PEN Uganda, showed the students ways in which the craft of writing is critical to understanding society. He shared his professional experience as a writer, editor and journalist with most of the major print publications based in Kampala. These have been with The New Vision, The Monitor and Fountain Publishers. 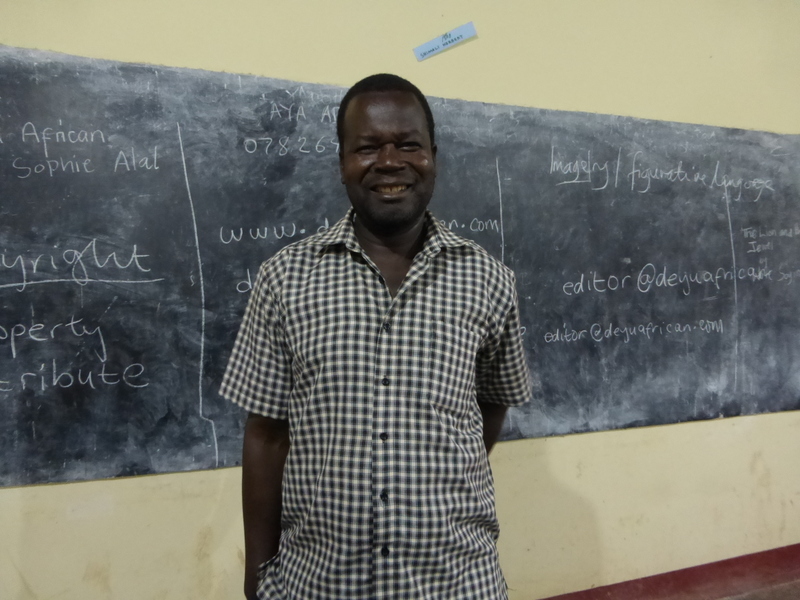 He was keen on contributing to setting the students on a path to loving the craft of writing. Kisiki said that it’s a good thing to be a writer since writers play an important role in any society. Through their analyses, they can find gaps and recommend solutions to problems of the day. “I believe that a writing person is someone who can become a positive builder of society. You can’t write without reading broadly and you cannot read without writing,” Kisiki explained. Over the course of two hours, we encouraged even those who were not members of the Literature Club to write. Because their stories matter. 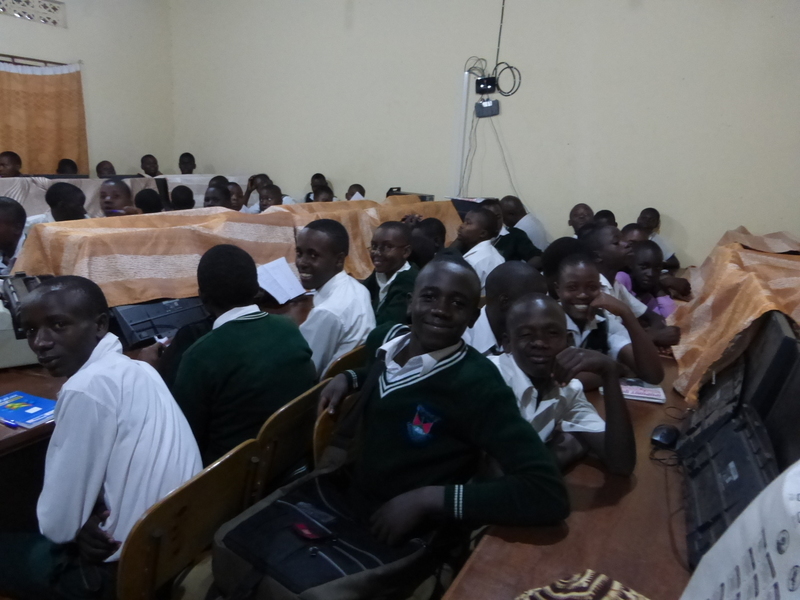 During the question-and-answer session, the students asked about intellectual property and how to get published. Ms Lamwaka gave a list of places where to submit work to, including Deyu African. I admit now, as we did then, that we did not have enough time to deeply explore issues of copyright. We could have done much more to impart practical skills on matters of research for stories, publication, and how to avoid plagiarism. Clearly there is a need for more sessions, so that current writers, and aspiring writers can continue the storytelling tradition. Inspirational engagements can steer learners into telling stories that fully articulate their imagination. 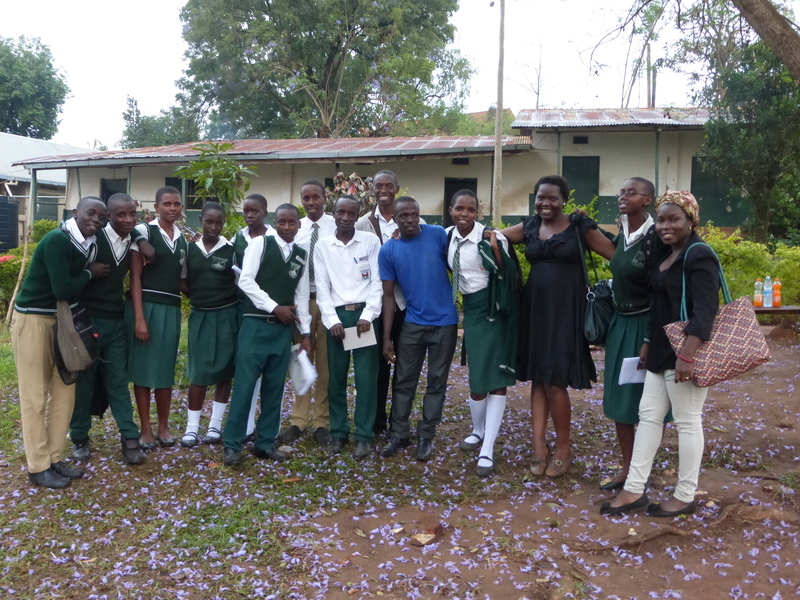 Ms Lamwaka said that it was an inspiring experience for her too. “You could see that the children were so attentive and knew that this was an important and sublime event. They stayed until after classes –past 6:00pm,” she said. 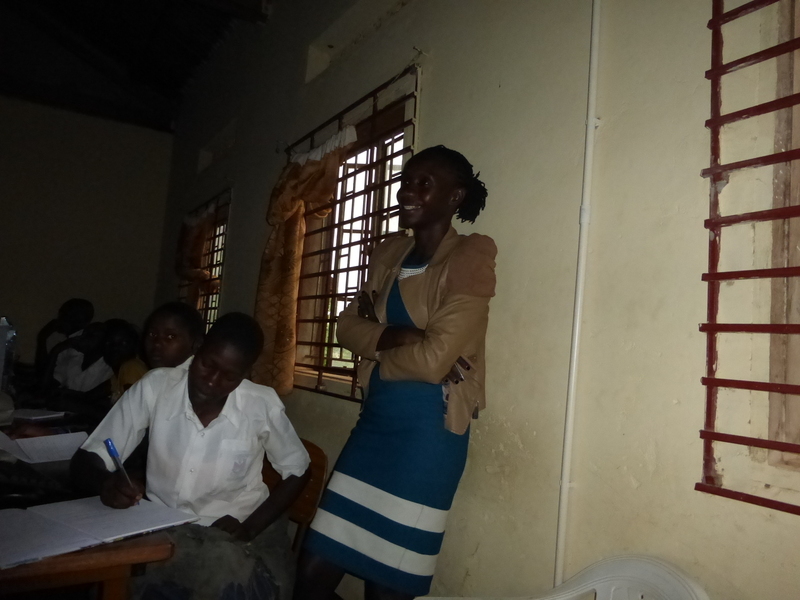 On behalf of the Literature Club, Murekatete Yvette gave a vote of thanks for the session. She said that the session was especially memorable because it was the first time the students were meeting writers. “We hope that you shall come back,” she requested. Under the jacaranda tree. Members of the Literature Club and Speakers. We had refreshments and then went out and took pictures. We posed under the canopy of a huge jacaranda tree in full bloom. These trees only bloom in the dry season and by the time the new rains start, the blooms are no more. The compound was resplendent with freshly fallen purple blossoms. 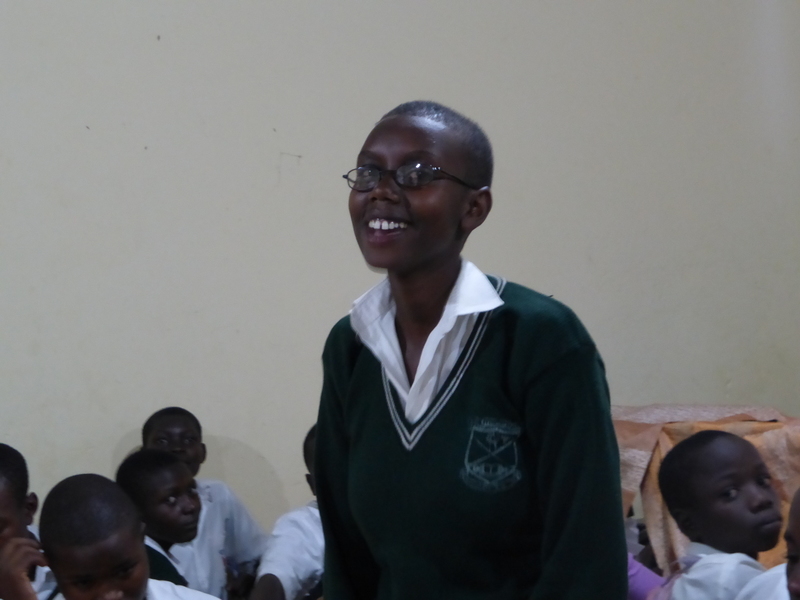 Ms Oketta hopes that through their club, the students will gain more confidence in their own writing. This article originally carried Anna Deavere Smith‘s quote. Trip to Kira SSS Members of the Writer’s Club. Job well done! It’s very important that students interact with living writers. Reach out to more schools please, if you can. Thank you David. It’s our hope that we can reach out to more young writers.